Sometimes referred to as "The Mitten" or "The Hand" because of its shape, the Lower Peninsula of Michigan is generally flat and comprises two-thirds of Michigan’s land mass. The Lower Peninsula is often divided into the sub regions of Northern Michigan, West Michigan, Mid-Michigan, Southeast Michigan and the Flint/Tri Cities area (also known as "the Thumb"). The peninsula is marked by many lakes, marshes and inland rivers. Detroit is the largest city in Michigan and is famous as both the Motor City and Motown. Detroit is also the only U.S. city that bordered by a Canadian city on the South. Grand Rapids is the second largest city in Michigan and the primary urban center in the Western half of the state. The city has long been a major manufacturing center. Lansing is Michigan's capital city and is home to Michigan State University. The area is an important center for government, educational and research institutions. Best known as the home of the University of Michigan, Ann Arbor is a known for high tech industry and a vibrant arts and entertainment scene. Dearborn the hometown of Henry Ford and is the location of the Ford Motor company’s headquarters. Known as the nation’s center for the automobile industry, Michigan is also a leader in information technology, business and manufacturing. Mining remains important in the state, in particular limestone, salt, and iron ore. The vast majority of Michigan’s farmlands can be found in the Lower Peninsula. Among the most important crops in the state are corn, soybeans, wheat and sugarbeets. The state’s lakes and waterways provide ample opportunity for fishing and boating, and in the summer thousands flock to beaches and lake front resorts. 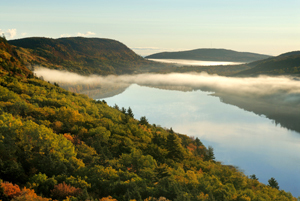 Outdoor enthusiasts enjoy 99 state parks and thousands of miles of hiking and bike trails. Hunting is a major pastime in Michigan, and peninsulas offer excellent opportunities to hunt big game, small game, waterfowl and upland game birds. Michigan is also a fantastic place for golfers, with over 900 golf courses (more than any other state) long summer hours and a persistent autumn season. All of the major professional sports leagues have a team that call Michigan home, and heated college rivalries keep sports fans entertained all year long. Each winter Michigan transforms into a snow covered landscape ideal for winter sports. Michigan boasts some the Midwest’s best downhill skiing and snowboarding resorts, miles of cross-country and snowmobile trails and even the U.S. National Ski & Snowboard Hall of Fame and Museum. All told, some 840 runs, and 40 terrain parks can be found within Michigan’s peninsulas. Michigan also boasts world-class educational institutions, outstanding museums and extensive public libraries throughout the state. There are at least 7 symphony orchestras in the state, and many cities host individual concert seasons. Over 45 wineries can be found in Michigan, located in some of the most beautiful areas of the state. Separated from the Lower Peninsula by the Straits of Mackinac, the Upper Peninsula (or simply, the "U.P.") is characterized by dense forests and rugged lakeshores. Bordered by Northern Wisconsin, Southern Ontario, and three of the Great Lakes, the Upper Peninsula makes up almost one-third of Michigan’s land mass. Steep highlands in the western portion of the peninsula give way to flatter lands of the Great Lakes Plain in the east. Marquette is the largest city on the Upper Peninsula, and is a major port on Lake Superior for shipping center for iron ore. The city is also home to Northern Michigan University. Sault Ste. Marie is Michigan’s oldest city, and is separated by its twin city of Sault Ste. Marie, Ontario by the waters of the St. Mary’s River. The Soo Locks, which allow ships to pass between Lake Superior and the lower Great Lakes, are located here. Whereas mining was once the predominant industry in the Upper Peninsula, tourism drives the economy of the region today. The unique geography and remote beauty of the U.P. 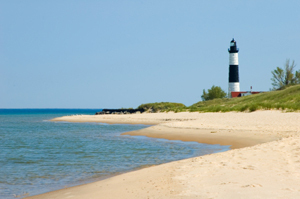 bring in thousands of visitors from the Lower Peninsula and Wisconsin every year. With huge stretches of land and low population densities, the peninsula is a prime spot for camping, hiking, fishing, boating, snowmobiling and hunting. Logging also remains a key business for the U.P. as well.